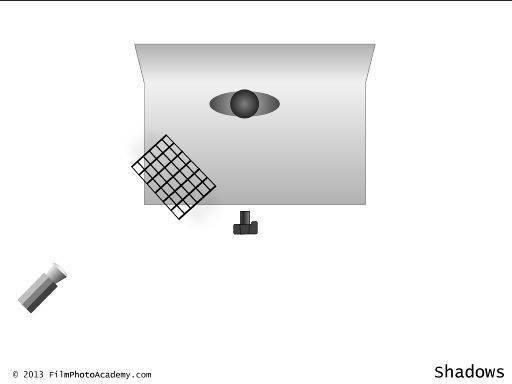 How to create your own shadow system and how to work it in your images. Casting shadows across your subject sounds so easy, but in practice turns out to be much harder than you would think. Creating a nice, sharp crisp shadow relies on two things: firstly getting the object creating the shadow as close to the subject as possible; secondly getting the light source as far as possible from the subject. In practical terms though limits to size of studio, getting the shadow object (called a "gobo" for "go between") close enough but not in shot can be a battle of compromises. One thing that helps is to use as close to a point source of light as you can. So using studio strobes but with all softboxes and reflectors removed, so it is just bare bulb. In fact your camera speedlight may do this job better than a studio strobe. The second thing you can do is use a focussing lens. For studio strobes these are usually Fresnel lenses. These let you shift your light from a wide beam to a tight beam like a spotlight. Studio strobe Fresnel lenses are expensive, but most hot video lights actually come with the built in for a fraction of the cost. A quick check showed I could buy a strobe Fresnel attachment for £600 or a complete video light with Fresnel for £300 (don't ask me why there is such a difference in price). So in this shoot I've used a single video light with Fresnel lens. With a little bit of focussing I can get those shadows looking quite crisp. I've had to bring the ISO up on camera to compensate for the relatively low levels of light compared to a strobe unit. I've also adjusted my white balance; video lights are a lot warmer in tone than studio strobes. Although I have left a little warmth in the white balance because I like the "sunshine" look it creates. When setting up the shadows and the poses try and make the pose work with the shadows. The lines of the pose maybe will echo those of the shadows. Also pay particular attention to the shadow of your model. A perfectly posed model may not be creating a perfectly posed shadow. Often you need to rotate the model a little to create the right effect. Changing the camera angle, models position and distance of the gobo has completely changed the look of the whole setup.